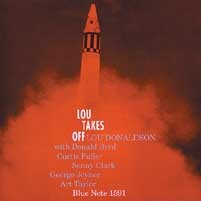 Altoist Lou Donaldson, who tends to get lost in the Blue Note all-star shuffle (even after making over 20 LPs for the label) is in his prime with this jam. Admiring the approach of Charlie Parker and Johnny Hodges, Donaldson combined the late 1945-55 bop alto scene with a heavy dose of r&b to come into his own. Originally released in 1959, one full year after the mono version, this set riffs on the space-race-craze, which was in full swing.